Brightwell is a village and civil parish in the Suffolk Coastal district, in the English county of Suffolk. It has a church called St John The Baptist. For transport there is the A12 road nearby. It is near the large town of Ipswich. 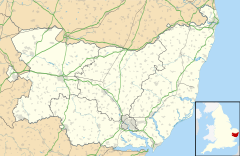 Adjacent parishes include Foxhall, Bucklesham, Martlesham and Newbourne. The population at the 2011 Census was only minimal and is included in the civil parish of Foxhall. In the fifteenth century Brightwell Manor was possessed by William Curzon. His son, Sir Robert Curzon, Knt., created a Baron of the Holy Roman Empire by the Emperor Maximilian for his gallantry against the Turks, was a Yorkist conspirator and declared a traitor in 1501, although was later back in favour at the English Court. It is possible that Brightwell was forfeited by him in 1501 as he is thereafter referred to as "of Ipswich". Brightwell Hall was extensively remodelled about 1663 by Sir Samuel Barnardiston MP, leader of the Suffolk Whigs and a deputy Governor of the East India Company. It was demolished in about 1755 but traces of the park's parterres and garden walks still remain. John Constable painted a landscape in oil in 1815 of Brightwell. ^ Corder, Joan, FSA., editor, The Visitation of Suffolk, 1561 by William Hervey, Clarenceux King of Arms, London, 1981, vol.1, p.175. ^ Blatchly, John, and Haward, Bill, Sir Robert, Lord Curson, Soldier, Courtier and Spy, and his Ipswich Mansion. Ipswich, 1982. ^ Cockayne, G.E., The Complete Peerage, edited by the Hon. Vicary Gibbs & H. Arthur Doubleday, vol.iii, London, 1913, p.579-580 and notes. ^ "Tate Collection Brightwell Church and Village by John Constable". Retrieved 2010-11-28. This page was last edited on 6 November 2018, at 13:04 (UTC).